Those privileged enough to have traveled on the waterway, as your correspondent recently did, would notice the locks – including the iconic Miraflores and Pedro Miguel locks – serve as water lifts to raise or lower ships from the Pacific or Atlantic Oceans, depending on their North or Southbound routes, either side of the Isthmus of Panama, to the artificial Gatun Lake 27 meters above sea level; the Canal’s connecting water body for transit. Ship transits through the Panama Canal’s Miraflores Locks © Gaurav Sharma, 2018. 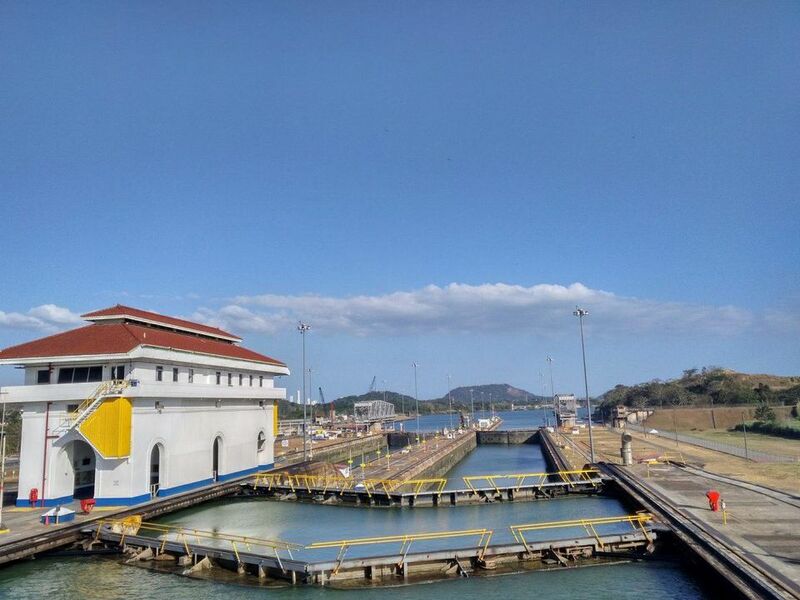 Unsurprisingly, eyeing bigger business opportunities, and following an approval via a public referendum, the country’s government decided to invest $5.3 billion to expand the Panama Canal in 2007. 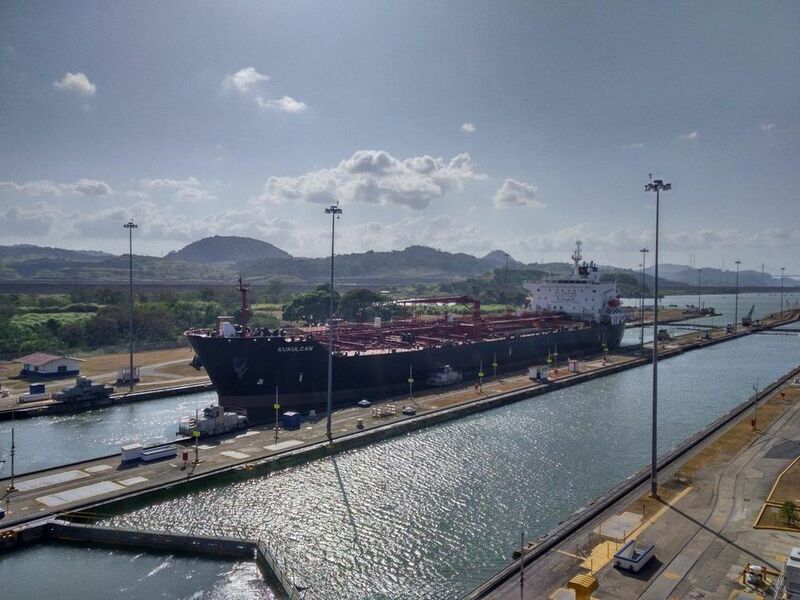 The expanded canal, inaugurated on 26 June 2016, saw two new lock complexes on the Pacific and Atlantic sides double its capacity and ability to handle larger ‘Neopanamax’ (or Aframax) class vessels. PCA says the expanded Canal’s expansion, a mere six months on from U.S. President Barack Obama’s decision to lift a moratorium on American crude oil exports, and rising natural gas exports from the Gulf Coast following the American shale bonanza, has had a “transformative impact” on the cargo mix transiting through the canal. 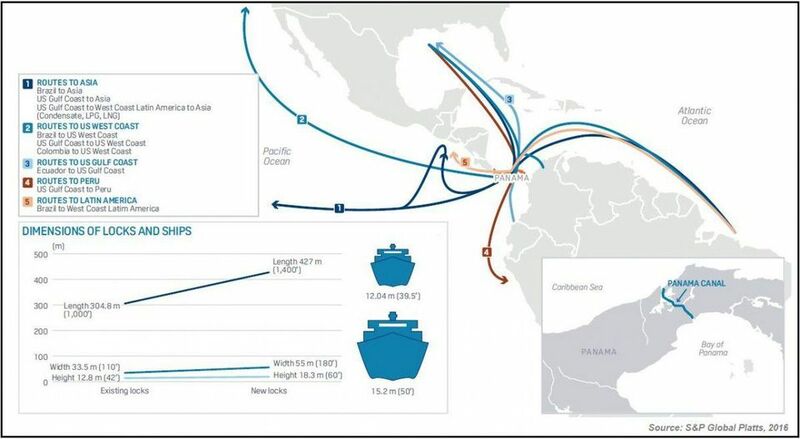 Of course, the PCA is keen flag its global credentials with “144 trade routes traveling through the waterway, serving some 1,700 ports worldwide, including 85 direct destinations in Europe and the Americas.” But even a perfunctory study would reveal the U.S. is by and large the most active user of the canal. Official PCA figures, ironing out daily fluctuations, put U.S. transits at 68%; well above second-placed Chinese transits at 18%. 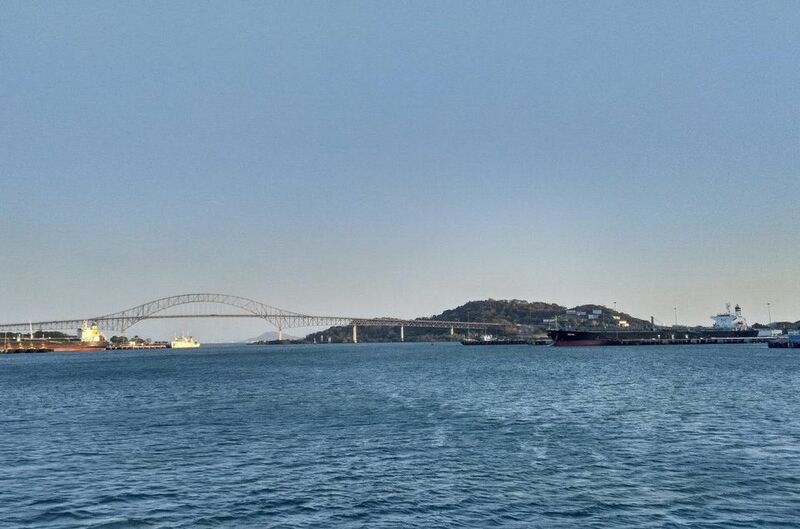 Narrowing U.S. transit data down even further, it emerges that the state of Texas is the Panama Canal’s top trading partner via its petrochemical and gas exports. Fueled by shale, U.S. exporters have plenty to be happy with the expansion. Prior to its expansion, the Panama Canal could only accommodate Panamax vessels of up to about 80,000 deadweight (dwt) and a draft of under 39.5 feet. However, following the expansion, and what the PCA describes as “other logistical improvements”, the Canal can currently accommodate the aforementioned Neopanamax class vessels, capable of carrying 120,000 dwt; the preferred capacity size of 80% of the world’s LNG fleet. Inevitably many Panamanian eyes are on dispatches from Sabine Pass on the Texas-Louisiana border, which houses Cheniere Energy’s LNG export terminal; currently the only LNG exporting facility in the Lower 48 U.S. states. The company recently dispatched its first cargo to India, and its Chief Executive Officer Jack Fusco says his intention is to double production capacity. And there are infrastructural and logistical impediments too. VLCCs or ‘Very Large Crude Carriers’ of 550,000 dwt capacity, preferred by large oil traders, cannot transit through the Canal. Lower volumes, given the Canal’s toll charges, don’t make sense for many, given arbitrage opportunities in Asia often influence the direction of travel. 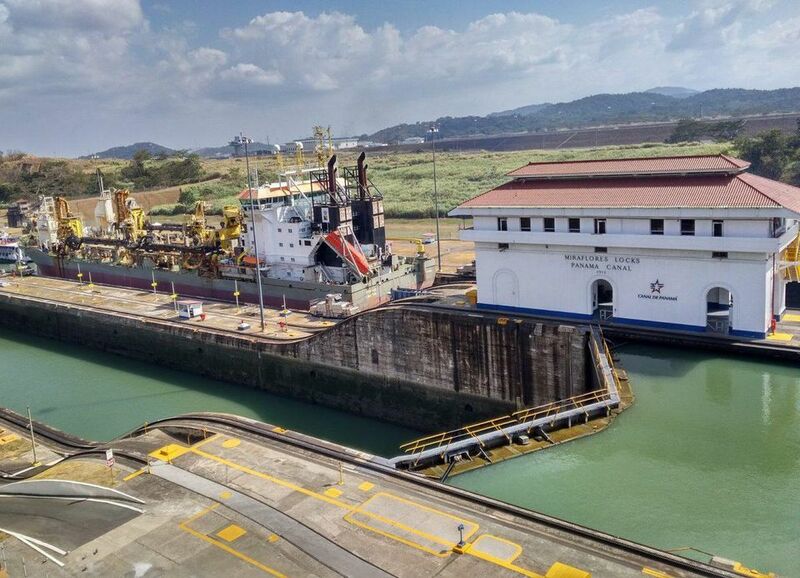 At full capacity, the expanded Canal’s new locks could move 12 Neopanamax vessels daily, but the figure has not been reached yet. Transits currently average 5 Neopanamax vessels per day. “Furthermore, at this stage, the capacity of the Canal for LNG tankers remains limited, with only one slot per day allocated to LNG tankers. As U.S. LNG production increases in 2018 and beyond, the Canal is likely to become a bottleneck, even as an additional slot is planned to be allocated to LNG tankers,” Lang adds. Source: Gaurav Sharma / Forbes.